affordable way to keep your assets looking their very best. Durable Powder Coating began as the paint department for Fence-All, the local fence and deck experts in the Ottawa/Gatineau area. As our experience, staff, and facilities grew there came a time when it made sense to open our doors to anyone needing quality paint services. They swung open for good in 2008 and now we’re celebrating our 10th year as paint specialists. We look forward to many more years to come. Whether you are looking for a specific type of finish, a custom colour, sand blasting and preparation time, or you just need to coat something that’s “ready to go” in one of our standard colours, Durable offers all of the solutions needed to help make your project a success. Update your rims and make your entire vehicle appear new and exciting again. It’s popular, easy, and cost effective. Whether it’s a motorcycle or a bicycle, we offer options for coating all metal parts to help make your bike new and exciting again. Steel furniture is highly decorative, ornate, and because of people like us it’s available in any colour imaginable. Fender covers, hoods, bumpers, truck racks, trailer tongues, and tool boxes are a large part of what we do every day. With 24/7 exposure to tough weather the long term protection that powder coating provides is an obvious must for all iron railings, fences and gates. Door handles, hinges, musical instruments and more. Any metal, any shape, any colour. Durable has you covered. Powder coated items generally have fewer appearance differences between horizontal surfaces and vertical surfaces compared to “wet” painted items. Powder coating can produce much thicker coatings without running or sagging. The electrostatic process provides a much more consistent coating thickness. Powder coatings emit nearly zero volatile organic compounds. Powder coating overspray is recycled to achieve nearly zero waste. We offer a range of specialty effects that are impossible to achieve otherwise. Although the idea had been around for several years, the technology and equipment for electrostatically applied powder coating became much more standardized and streamlined throughout the 1960s. As the environmental movement began demanding more stringent rules and regulations the electrostatic method of applying dry powder to products became more and more popular. It solved two problems at once: It vastly improved the consistency on finished products, and it greatly reduced the amount of waste. Powder Coating is better for the environment and for the customer who is looking for exceptional quality at affordable prices. Blasting – Who needs sandpaper? Abrasive grit blasting, or “blasting”, is our preferred process for cleaning product surfaces whenever we need to go beyond our typical multi-step washing. Blasting is one of the most efficient ways to strip off foreign materials. It’s similar to using sandpaper or a wire brush, but with better results on corners, nooks, and crannies. Painted products need to be blasted before recoating so that powder can stick to clean product. You don’t want the powder to stick to the old paint. If it does then the powder goes when the old paint flakes off. Common abrasive materials include: Silica Sand, Aluminum Oxide, Steel Shot, Glass Beads, Corn Cobs, Walnut Shells. The choice of abrasive is largely determined by the surface of the product being cleaned (aluminum, being softer, will damage easier than heavy steel so we would typically use a softer aluminum oxide instead of silica sand). Black steel comes from the steel mill covered in oil so it won’t rust in the warehouse. All of that oil needs to be blasted off so that the powder can stick to clean product. You don’t want the powder to stick to the oil. If it does then the powder goes when the oil dries off. Rust needs to be blasted off so that the powder can stick to clean product. You don’t want the powder to stick to the rust. If it does then the powder goes when the rust flakes off. Durable Powder Coating guarantees that all products; under normal and intended uses, and as per all terms and conditions as listed in this Warranty; for a period of one year, will not chip, crack, fade, pit or peel. All Warranty Claims require the Customer to provide a copy of the original sales order, prior to the expiry of the warranty period. Durable Powder Coating guarantees that all products; under normal and intended uses, and as per all terms and conditions as listed in this Warranty; for a period of one year, will not chip, crack, fade, pit or peel. All Warranty Claims require the Customer to provide a copy of the original sales order, prior to the expiry of the warranty period. Normal and Intended Uses specifically does not include (a) spraying salt or abrasive cleaners/chemicals on the product; (b) damages caused by plant life, snow, earth or any other foreign materials directly on the product; (c) extreme heat; or (d) physical impact. 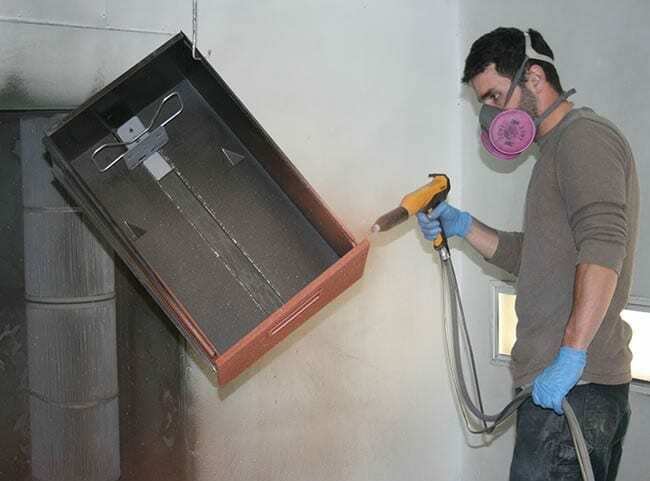 Other situations that are not covered under warranty include (a) corrosion or rust arising from underneath the coating, (b) covering over chrome, hot-dipped galvanizing or any other smooth finishes which are specifically designed to deter paint from attaching, or (c) covering directly over an existing finish – including oil finish on black steel. Cash, Debit, Money Order/Bank Draft, Visa, MasterCard, or American Express. CHEQUES are accepted, but product will NOT be scheduled to be coated for a minimum of ONE WEEK. Special credit terms for Repeat Customers. As negotiated with our in-house Credit Manager. First time/one time customers are NOT generally offered special credit terms. Unless the product has already been dropped off to Durable for coating, prices are all subject to increase without notice. Prices are all “plus taxes”. The acceptance of a shipment by the Customer’s choice of carrier shall constitute a delivery by Durable to the Customer, the same as if the Customer came to pick up from our facilities. Durable reserves the right to dispose of any completed goods that have not been collected by the customer within thirty (30) days from notice of completion. The Customer recognizes they are responsible for all costs incurred by Durable with respect to such disposal and that Durable may recoup any of disposal costs, and/or balances owed to Durable, by way of selling off the goods. Durable shall not be liable for any loss, damage or costs to the Customer incurred as a result of non-performance or delay in performance that is due wholly or partly to accident, fire, strike, Labor shortage, riot, war, acts of God, delays by suppliers, or any other cause beyond the reasonable control of Durable; provided that Durable shall proceed to diligently complete orders as soon as the cause for delay is removed and conditions permit. Durable’s liability shall be limited in all cases to the Customer’s actual direct damage to the products, and Durable shall not be liable for any prospective profit or for any special, indirect, punitive, exemplary, aggravated, consequential damages resulting from non-delivery, late delivery, or inability of the Customer to use the Goods. Durable shall act in accordance with normal tolerances, variations and limitations; consistent with practical testing and inspection methods familiar to the powder coating industry, as determined by Durable Powder Coating; in respect to composition, colour, finish, grading and/or quality. Durable accepts no responsibility for the structural integrity of the product being coated, and are in fact only responsible for the coating that they were hired to apply. If you live in the Ottawa/Gatineau area and would like a quote on your durable powder coating project please complete the following form. Looking for a quote on your durable powder coating project? Complete this form and someone from our team will be in touch with you shortly!